The Young and the Restless news indicate that the show’s producers are planning a special storyline for Kristoff St. John’s character, Neil Winters along with his real life persona. The actor sadly passed away in his home near Los Angeles during the early hours of Monday morning. An autopsy is currently being conducted. Kristoff has played Neil on the show since 1991. While no details have been released just yet, head of CBS daytime executive Angela McDaniel has stated that the series is currently working on a way to feature Neil Winters in upcoming episodes along with a tribute to the actor. Unfortunately, Neil Winters has not had much of a storyline these last several weeks, although he has been around to help support his troubled family. The actor’s final scene on The Young and the Restless aired on Wednesday. The CBS network encouraged many social media fans to share their photos of the actor as a special tribute to the talented daytime television star. 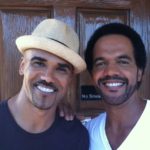 It’s without a doubt that Kristoff St. John will definitely be missed on the show. A lot of fans appreciated his love story with Drucilla Winters (played by actress Victoria Rowell) over the years. The Young and the Restless airs weekdays on the CBS network. Check your local listings for times. In the meantime, drop us a line with your thoughts in our comments section below. And as always, come back to Daily Soap Dish for all the latest news, updates and spoilers on all of your favorite daytime television shows right here.